Discussion in 'Star Style' started by LolaSvelt, Mar 28, 2009. I think there should be a thread for the fashion in Skins. You can even post pictures of the cast (from all seasons) outside of the show! I love Skins fashion, especially in the newest series where it has gotten a little edgier. I can't wait to see pictures! I've always loved that leather jacket Effy always wears. I would post a picture but I'm a school computer. TheGlassAngel, is this the leather jacket? If so, I love it too lol. I love that jacket! I've been looking for one like it. Does anyone know where it is from? Is Kaya's dress from Urban Outfitters? I think I remember seeing it somewhere! love effy's taste in clothes in the show. especially the leather jacket. i also had a pair of jeans that i cut up about a month ago, and i watched Effy's ep. and she was wearing a similar pair, haha. Ok the new season is alright, but i realllllly miss the first two. Especially Michelle and Cassie, who were so original in their fashion choices. how can we forget this??? That's funny you say that, I was surprised to see Effy wearing the Sid & Nancy top from Topshop...I own it! I've been waiting for this thread, I was going to start it myself but good job LolaSvelt! Gosh, you read my mind! I was just wondering if there was a thread on Skins fashion and was going to start one if no one had. Then I did a forum search and saw that you'd started this one 20 hours ago. Does anyone have better pictures of it? I can't seem to find any. It's a vintage dress, according to the Skins wardrobe people. ^ This one made me a little obsessed with gold glitter shoes. The Skins wardrobe crew made hers by glueing the glitter on to a pair of tap dancing shoes. The sailor shirt is vintage, and I think I remember someone saying the sunglasses were from Topshop but I'm not 100 percent sure. A dodgy leather shop in Bristol according to the Skins E4 blog. ^ She had the most interesting wardrobe! 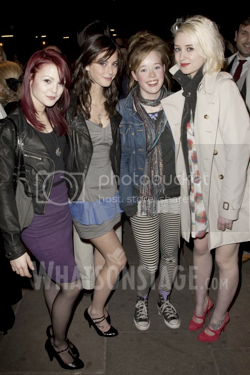 I love Emily's skirt, Effy's Givenchy-esque necklaces and her biker boots from Sancho. All images from E4 and Kayascodelario.net.